On September 23, Mr. Zhao Weiping, the Chinese Consul General to <?xml:namespace prefix = "st1" ns = "urn:schemas-microsoft-com:office:smarttags" />Chicago, hosted a reception to celebrate the 65th anniversary of the founding of the People's Republic of China at Hyatt Regency Chicago. About 600 guests attended the event, including the Lieutenant Governor of Illinois Sheila Simon, Secretary of State of Illinois Jesse White, Director of Illinois Department of Agriculture Bob Flider, Director of Illinois Department on Aging John Holton, Mayor of Logansport, Indiana Ted Franklin, Mayor of Urbana, Illinois Laurel Prussing and 8 lawmakers from the Illinois General Assembly. Governor Pat Quinn of Illinois and Mayor Rahm Emanuel of Chicago both sent representatives to read their letters of congratulation. In his remarks, Consul General Zhao extended his cordial greetings and best wishes to the Chinese community and friends from all circles of life in the consular district. He said that the reception was held to celebrate not only China's remarkable achievements during the past year, but also the new progresses in the development of China-US relations as well as the cooperation between China and the nine states in the consular district. "This is an important year of deepening reform for China. The Chinese government and people have been making great efforts in carrying out the ambitious and comprehensive reform program as announced at the end of last year. China's social and economic development is progressing in conformity with the goal of the Chinese government," he underlined. Consul General Zhao said that during the past year, the overall China-US relationship had advanced steadily, with practical cooperation deepened in many fields. "The interests of our two countries are so deeply intertwined that every one of us can feel the benefits of a sound China-US relationship," the Consul General added. Consul General Zhao also expressed confidence in the future of China and China-US relations. "In pursuit of the Chinese Dream of the national rejuvenation, China will unswervingly adhere to the path of peaceful development and continue to work hard in building the new model of major country relationship between China and the US," he said. The Consul General hoped that friends in the consular district would continue to seize the opportunities arising from the development of China's economy and China-US relations and work together to elevate the friendly relationship and cooperation between China and the nine states in the consular district to a new level. 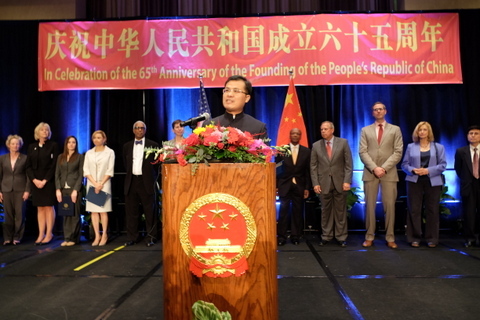 The guests warmly congratulated the 65th anniversary of the founding of the People's Republic of China. They spoke highly of the new achievements in China's economic and social development and had full confidence in the prospect of the friendship and cooperation between China and the Midwest America. The reception also featured live art shows of traditional Chinese music and a highlight of "Ballet Liang Shanbo and Zhu Yingtai", a Chinese romance story also known as "the Butterfly Lovers".